A central question in Alzheimer’s Disease (AD) is whether the neuritic plaque is necessary and sufficient for the development of tau pathology. 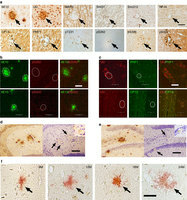 Hyperphosphorylation of tau is found within dystrophic neurites surrounding β-amyloid deposits in AD mouse models but the pathological conversion of tau is absent. Likewise, expression of a human tau repeat domain in mice is insufficient to drive the pathological conversion of tau. Here we developed an Aβ-amyloidosis mouse model that expresses the human tau repeat domain and show that in these mice, the neuritic plaque facilitates the pathological conversion of wild-type tau. We show that this tau fragment seeds the neuritic plaque-dependent pathological conversion of wild-type tau that spreads from the cortex and hippocampus to the brain stem. These results establish that in addition to the neuritic plaque, a second determinant is required to drive the conversion of wild-type tau.